What name was originally given to Mickey Mouse? Who disliked the name and suggested it should change to Mickey? "Mortimer Mouse" had been Disney's original name for the character before his wife, Lillian, convinced him to change it, and ultimately Mickey Mouse came to be. Mount Everest is the highest place on Earth, but there are higher mountains in the Solar System. What is the name of the tallest mountain in the Solar System? One former President of the United States was also a former governor of New Jersey. Who is this person? On October 12, 1492, Christopher Columbus found the New World. What day did he set sail on this historical trip? "Four score and seven years ago..." is the start of this very famous speech given on what date? The cheetah is the animal that can run the fastes. What animal can move at the fastest speed? with a diving speed of 242 mph. 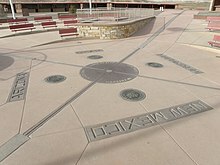 What is the name of the place where four states touch at one place? What four states meet at that point?